It's been a long time since I last went skiing, or played-about in the snow. Last time I ever did both was... *thinks about it* ...1999. Damn, 10 years! I've been looking forward to this for a while, and have used it as an excuse to make several sweet purchases in the past couple of weeks: new jacket, beanie, socks, and sunglasses. However, I'm wondering if my workmates will actually notice my absence. Workmate farewell #1: "Enjoy your weekend." Workmate farewell #2: "See you next week." 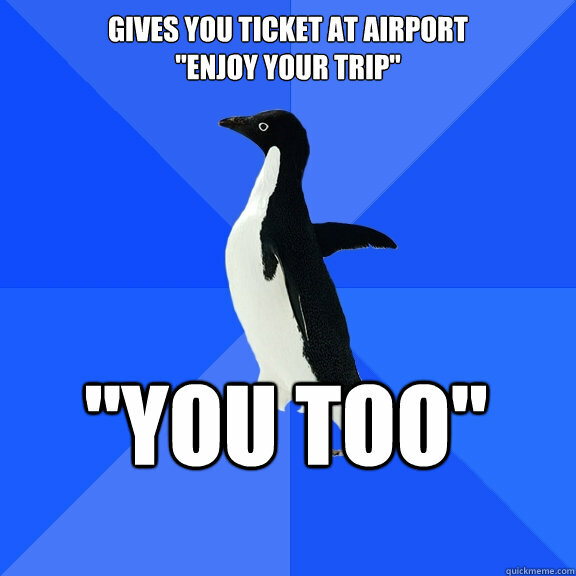 I guess I'm just reminded of those images of Socially Awkward Penguin when it says something along the lines of: Taxi driver drops you off at the airport. He says, "Enjoy your trip!" You say, "You too!" If you're reading this, then I'm out enjoying the snowy slopes of my ski trip... or faceplanting into the snow. Given the winter we've been having, you think it'd be smarter for me to go somewhere sunny eh? I'll be back in the office Monday 27th July, hopefully in 1 piece, without too many bruises or leg/arm/neck braces. What I don't know though, is if I'll get internets up there, but I'll try remember to Tweet / update Facebook status daily from my phone with my injury statistics.